Did I neglect to share the latest PBS happenings with all of you? You can catch my tips for a great Batesville, Indiana trip on PBS’ The Weekly Special or watch it below. My short segment highlights one small Indiana town each time–just like what I do on Little Indiana except for the film crew, microphones, scripts, set, lights, props, and studio time. That’s the pep talk I give myself before filming anyway. Ahem. It takes a bit to get used to but, then again, I’ve never been able to STOP talking when it comes to these small towns. It’s a whole lot easier than I thought. You can catch me in Batesville, Indiana right here, on the PBS website, or on YouTube. There’s always more where that came from! With a little luck, I will be able to snag a sponsor which would mean a full length show for you! 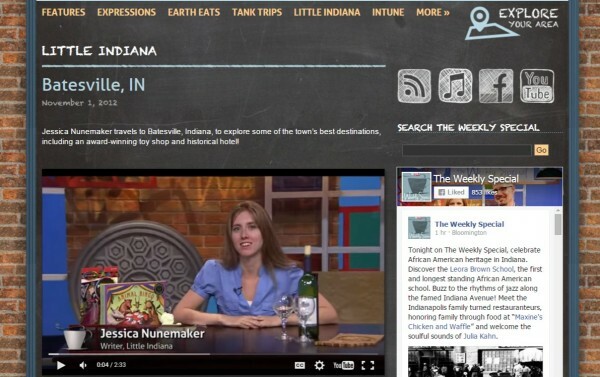 A whole show devoted to our awesome Indiana towns? Would that be awesome or what? Batesville is a neat small town. They’ve got a slew of unique features that make it a fabulous destination. I love the story of Weberding’s Wood Carving. You’ll learn about an unexpected shopping find that’s a “can’t miss.” We are talking serious square footage here with an awesome variety. Have I yet mentioned the inn that’s old enough for your great grandparents to have slept in? The rooms here are so interesting! There’s no square, boring shapes here. The Sherman House Inn has a fabulous history. You’ll dig their lending library, too. What about the insanely imaginative toy shop? It’s our boys favorite. We could not get over how fantastic Christian’s Kinderladen toy shop was. She honestly only stocks the “good” toys, you know, the kind of toys that kids play with again and again. It’s brands you know, or brands you should get to know. Her front windows were so fun and magical–no wonder she has won awards for her independent toy shop! We had such a full couple of days so we appreciated having somewhere to go that was all about the boys. Pure magic. Of course, there’s plenty more where that came from. It’s amazing the things you can find in a small town–and at locally owned shops. Browse Little Indiana. Look for things to do in your own backyard. I bet you will be surprised. Branch out. Hop in the car and take off. Choose a town or choose a county. Who knows what you will find? I bet it will be great! At least you can get started with Batesville by watching my PBS segment right here. Thanks for everyone in the studio for making it all so easy. Just don’t forget to tell them that Little Indiana sent you!